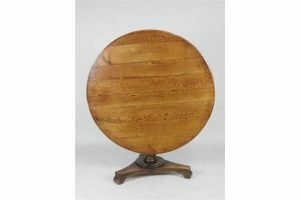 A Victorian oak pedestal circular breakfast table with short column of a tripartite base. 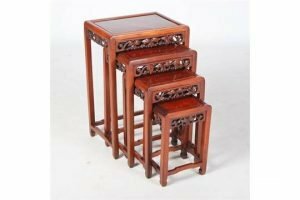 A quartette of Chinese walnut occasional tables, early 20th century, the rectangular burr wood panelled tops above pierced and foliate carved frieze, raised on square section supports united by stretchers. 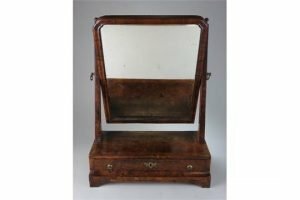 An 18th century walnut veneered feather strung swivel toilet mirror, the rectangular mirror plate with re-entrant top corners to the frame on tapering supports and a single drawer box base, fitted with ring handles raised on short shaped bracket feet. 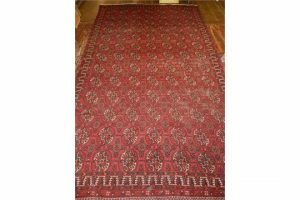 A red ground Turkoman carpet, decorated with rows of elephant pad medallions within geometric borders, fringed. 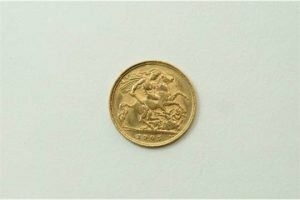 A 1914 gold half sovereign. 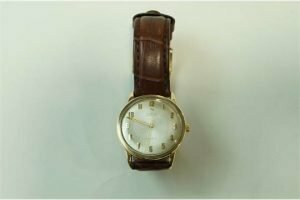 An Omega gentleman’s 9 carat gold automatic wrist watch, the circular white dial with gilt hands, sweep seconds and Arabic numerals, the inscribed three piece case. 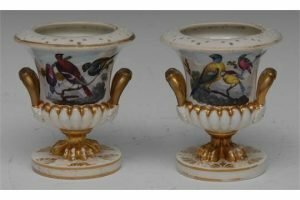 A pair of Derby lobed campana shaped vases, painted by Richard Dobson, with panoramic birds, perched on branches, three paw feet. 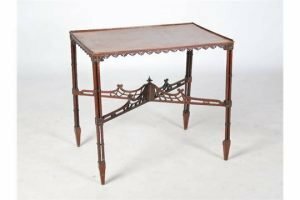 An early 20th century mahogany silver table in the George III style, the rectangular top above an arcaded apron, raised on quadruple cluster column supports united by a pierced and scroll carved X-shaped stretcher. 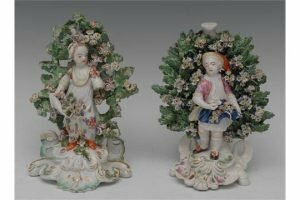 A pair of Derby Patch Mark figures, of a boy and girl, standing before bocage, both with flowers in their aprons, pierced scroll bases. 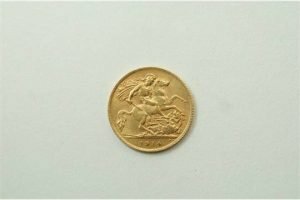 A 1905 gold half sovereign. 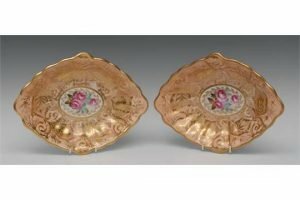 A pair of Derby navette shaped dishes, the centres painted with three roses, within a gilt oval cartouche, the salmon ground with gilt Regency scrolls. 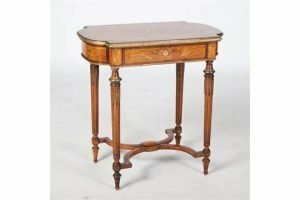 A late 19th century French walnut, marquetry inlaid and gilt metal mounted work table, the shaped rectangular top inlaid with a twin handled urn issuing flowers and foliage below ribbon tied garland flanked by scrolling foliage, opening to a fitted interior above a single frieze drawer, raised on four tapered cylindrical supports with reeded detail united by concave X-shaped stretcher. 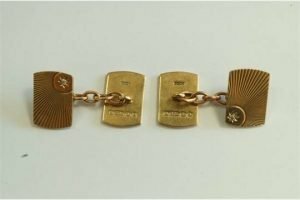 A pair of 9 carat gold and diamond cufflinks, London 1956, the rectangular panels with sun ray design and a star set single cut diamond to one corner, chain connector to a plain back panel. 8.6 grams. 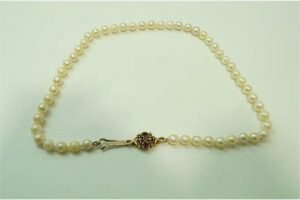 A uniform row of cultured pearls, the fifty one pearls of approximately 6 mm diameter, to a four stone garnet cluster clasp stamped ‘9ct. 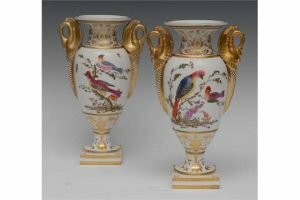 A pair of Derby two-handled pedestal ovoid vases, decorated with fanciful birds perched on branches, gilt swan handles, square plinths. 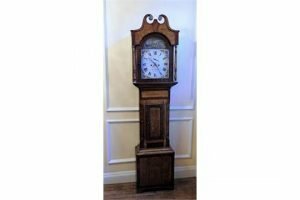 An early 19th century oak and mahogany thirty hour longcase clock, with false winding holes, centred subsidiary seconds dial and date aperture within a ring of Roman numerals, the arch with automated showing three masted ship coming into harbour. 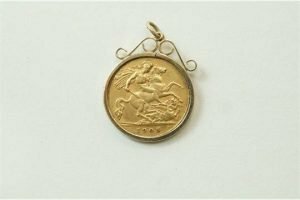 A 1905 gold half sovereign in 9 carat mount. 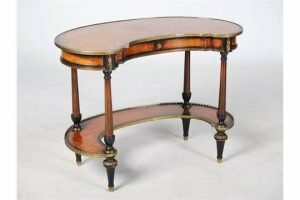 A late 19th century mahogany, ebonized and gilt metal mounted kidney shaped dressing table, the shaped top above a single frieze drawer, raised on four tapered cylindrical supports with simulated fluted detail, united by a crescent shaped under tier, raised on four tapered cylindrical supports with fluted detail and gilt metal feet. 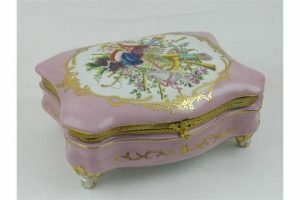 A painted porcelain jewellery box of cartouche form, in the style of Sevres, the hinged lid painted with musical instruments, raised on four feet. 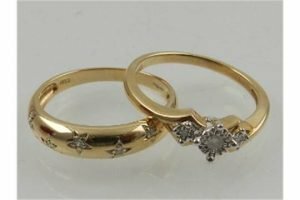 A 9 carat yellow gold and diamond set band ring, together with a 9 carat yellow gold and three stone diamond ring.